This is an important Aperture concept because it explains how your original files are always preserved intact. • Versions: These are Aperture’s representations of your photos, not the photos themselves. When you import pictures, Aperture creates a Version for each one in its library, and this is what you see and work with. It’s a ‘virtual copy’ of the picture, not the picture itself. When you use the Aperture editing tools, you’re editing the Aperture Version, not the original file. You can create any number of Versions of the same image within the Aperture library and edit each one differently – but these are virtual copies, not new files on your hard disk. • Masters (Originals): These are your original photos. Aperture never makes any changes to your Masters. They can either be imported into the Aperture Library itself (‘Managed’) or kept in their original location (‘Referenced’). Either way, they’re never directly modified. Aperture will either ‘Manage’ your images by importing them into its own internal library, or ‘Reference’ them in their existing location. • Managed: Managed files are kind of foolproof because if you can see the file you know it’s there, and the very fact of having your library on your computer (or external hard disk) means that all its images are there too. The disadvantage is that your Aperture library may be so large as to be unmanageable. A collection of 50,000 photos could produce a 500Gb library, for example. This is because the library contains all your Masters and all the copies you create in applications like Photoshop, plus the thumbnails, previews and other data accumulated by the library itself. If you want to know how big a managed Aperture library would be, check the total size of your whole image archive and then add 10-15%. • Referenced: Referenced files stay in their original location, which may even be on a separate drive. The advantage of this is that the library is separate to your Masters and small enough to store on an internal disk drive while your original images are on an external drive which you can plug in if you need to edit them (you can view and organise your photos without the Masters being present). 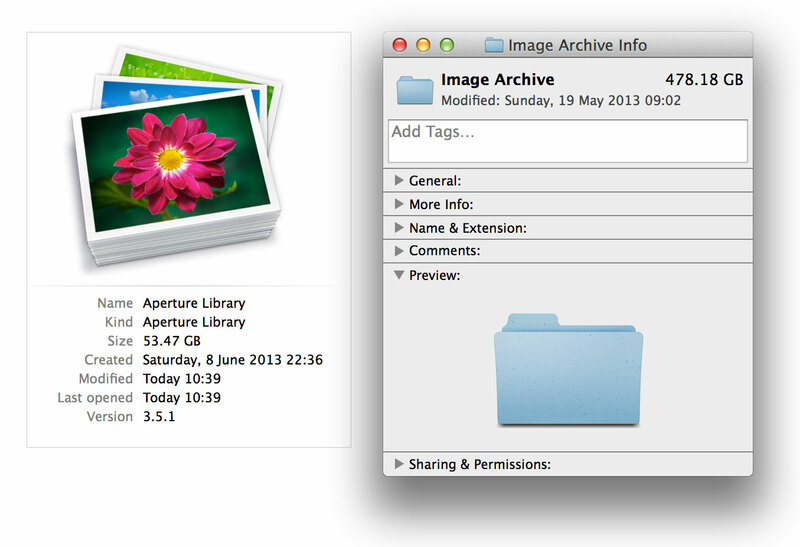 The disadvantage is that if the original files are moved or renamed outside of Aperture, the library may not be able to find them again – you’ll have to re-establish the link manually. My ‘referenced’ Aperture library is 53GB, and my image archive itself is 478GB. If I used a ‘managed’ approach instead, all my images would be consolidated into the Aperture library, which would be the size of both combined, i.e. around 531Gb – far too large for my MacBook’s internal drive.